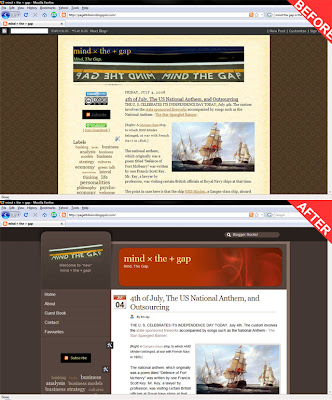 AFTER SPENDING NEARLY 6 MONTHS under the old 'skin', I thought it was almost time to give "Mind the Gap" an overhaul in look-and-feel. And trust me, it turned out to be a worthwhile and satisfying weekend indeed: Loading up Photoshop for 'grafix' on one hand and coding/debugging xHTML, css, js, and the whole of tech jargon on the other. Almost reliving the time ten years ago, the dot-com boom, and designing, developing and coding of websites with a passion of a rather naive young rookie, just "out-of-the-box" programmer! So, I did try the competition, and in the process I had the revelation *why* I loved Blogger.com over any other blog publishing software - Blogger gives you much more control and flexibility over your stuff (WordPress, for example, doesn't allow you to add even a simple hit-counter of your choice to your blog there! Sham! ).